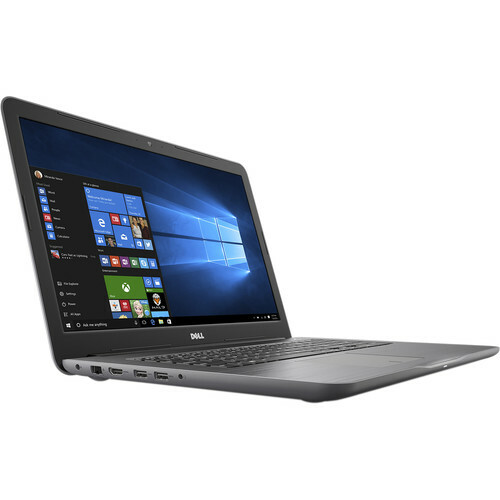 The 17.3" Inspiron 17 5000 Series Laptop from Dell is a versatile system designed to provide you with the computing power for your everyday needs. Powered by a 2.5 GHz Intel Core i5-7200U Dual Core processor and 8GB of 2400 MHz DDR4 RAM, it lets you efficiently multitask as well as quickly access frequently used files and programs. When you need more computing power, the CPU's core clock reach a boost frequency of 3.1 GHz. Its 17.3" display, driven by integrated Intel HD Graphics 630, has a 1600 x 900 resolution for crisp and clear content reproduction. An integrated HDMI 1.4a port can be used to output video to an external display. For storage, this system is equipped with a 1TB 5400 rpm SATA 2.5" hard drive that provides you with ample room for all your pictures, movies, data, and programs. Should you need more, you can connect external storage devices using its two USB 3.0 Type-A and one USB 2.0 Type-A ports, as well as its SD/SDHC/SDXC media card reader. To connect to the Internet, you can use its 802.11ac Dual-Band Wi-Fi or the 10/100 Fast Ethernet port for a more reliable and stable wired connection. Pair additional compatible wireless peripherals and accessories using Bluetooth 4.2 technology to save its USB ports for other devices. Other integrated features include a SuperMulti DVD drive, a 720 webcam, stereo speakers, and dual integrated microphones. The operating system installed is Windows 10 Pro (64-bit). The Inspiron 17 5000 series is built to be durable and is tested to endure multiple kinds of environments and situations. For example, it can survive in harsh short-term heat conditions of up to 149°F (65°C), the hinges on its lid endure after being opened and closed 20,000 times, its keys operate without failure after 10 million keystrokes, its touchpad buttons operates after 1 million uses, and the power and multimedia buttons survive 40,000 pushes. It also undergoes at least 10,000 hours of testing. After nearly 20 years, Microsoft has finally replaced its Internet Explorer web browser. With it, users can write directly on web pages and share notes with friends and colleagues. It also improves the online reading experience by adding a distraction-free mode and read-it-later functionality. Edge also has built-in Cortana integration; you can have her help you find a restaurant, make a reservation, and pull up directions without leaving your browser. Box Dimensions (LxWxH) 21.75 x 14.0 x 3.2"
Does this laptop can be downgraded to Win 7 Pro?